If you’ve ever gone out for brunch on a weekend, chances are you’ve seen a Bloody Mary (or several) being consumed. 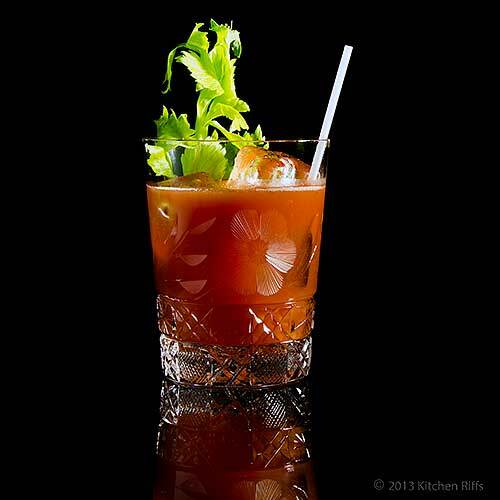 This piquant mix of tomato juice and vodka is a forenoon favorite in the US — and throughout much of the world. And why not? The Bloody Mary delivers a bit of a kick, but all that tomato juice gives you maximum beverage volume with minimal alcohol. Plus, the drink holds its own against the assertive flavors of common brunch fare like bacon, sausage, and eggs. In fact, its taste is so robust that people rarely want more than one. So you won’t get blotto at breakfast. The Bloody Mary is an easy drink to make at home when you host a big brunch. It also practically cries out for customization: You can spice it up or down to suit your own preference. Once you’ve developed the perfect recipe, you may find yourself inviting people over for brunch more often. Just so you can bask in their satisfied smiles as they sip your expert concoction. 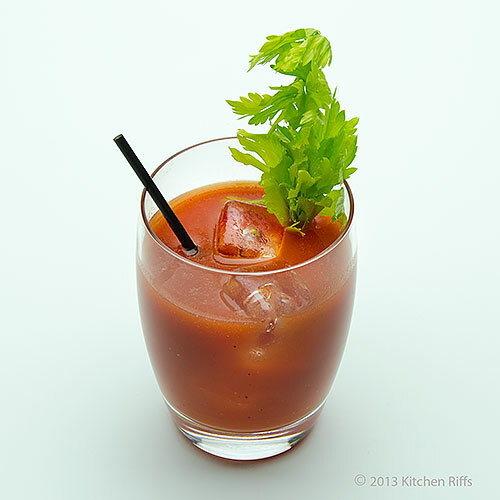 A Bloody Mary always contains tomato tomato juice and vodka, and usually Worcestershire Sauce and lemon juice. After those basics, ingredients can vary. Common additions include Tabasco sauce, salt (often celery salt), black pepper, and (sometimes) horseradish sauce. This is a drink that you want to experiment with, because everyone likes a different level of spiciness. I’ll provide a recipe that you can use as a template, and discuss some variations in the Notes. 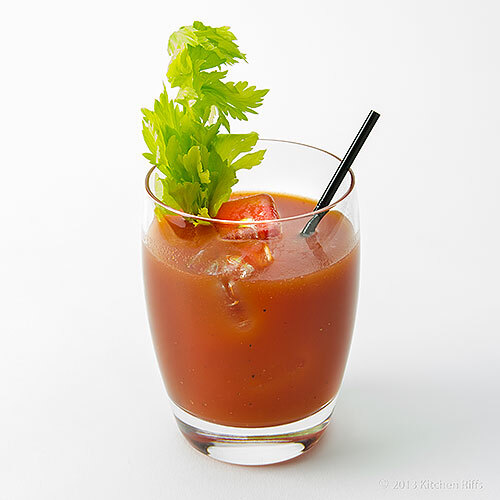 The Bloody Mary is famed as a “hair of the dog” remedy (meaning that if you consume too much alcohol the night before, it’s supposed to help assuage your pain the next morning). In truth, adding more alcohol to an already overloaded system isn’t a good idea. But at least the tomato juice will help hydrate you, and it will add some badly needed vitamins. BTW, the Bloody Mary can easily be adapted for nondrinkers or children: Simply leave out the vodka and you’ll have a Virgin Mary. Vodka provides no flavor (see Notes), so this mocktail is every bit as delicious as the actual cocktail. 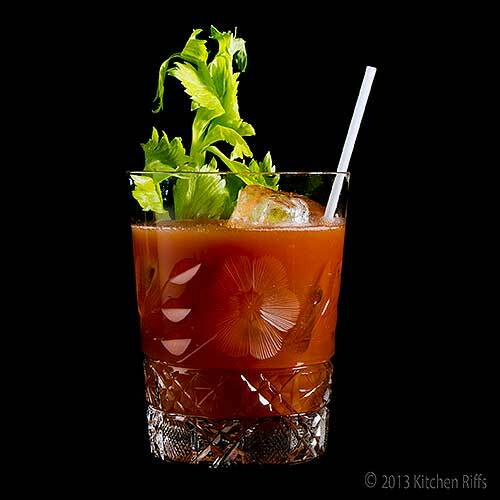 A Bloody Mary is usually served on-the-rocks in an old-fashioned glass or in a tall (Collins) glass. The recipe takes 5 minutes to prepare, and yields one drink. Combine all ingredients (except garnish) in a cocktail shaker half-filled with ice (see Notes). Shake vigorously for 30 seconds or so, until the drink is cold. Strain into an ice-filled rocks (old-fashioned) or tall (Collins) glass. Add a garnish if desired, and serve. You might also consider serving this drink with a short straw. You should shake rather than stir this drink because that’s the easiest way to get all the ingredients to mix together. However, this is a drink that some people prefer to “roll.” That is, they put all the ingredients into a mixing glass, then pour the mixture into a second glass, then back into the first. If you get a nice rhythm going, it looks like you’re continually “rolling” the ingredients back and forth between the glasses. The basic algorithm for this drink is: vodka, tomato juice, spicy stuff. But everybody uses different “spicy” ingredients. Most recipes call for 1½ or 2 ounces of vodka, and 3 to 4 ounces of tomato juice; after that, all bets are off. IMO you definitely want to use some Worcestershire sauce. Ditto Tabasco unless you really don’t like spicy. Some people swear by celery salt, although I find that regular salt works fine. I sometimes like to add horseradish (depending on my mood). Some people omit the lemon juice, but I think that’s a mistake. Whatever secondary ingredients you use, feel free to experiment with measurements until you find a formula that suits your taste. Robert Hess suggests substituting a tablespoon, give or take, of powdered ancho chile powder for the Tabasco. (I haven’t tried his version.) Even though a tablespoon seems like a lot, ancho chile powder isn’t that spicy. I like the idea, and might also experiment with dried chipotle chile powder, which has great flavor but is much hotter than ancho. If you go that route, definitely start with no more than a teaspoon, and adjust after you’ve tasted the drink. Vodka is made by distilling fermented substances such as grains, potatoes, or sometimes fruits or sugar mixed with water. It has no flavor (unless a flavoring, like lemon, has been added). Yes, I know some people can distinguish different vodkas by taste. But what they’re probably picking up on is how well filtered the vodka is. Cheaper vodkas seem “harsh” because they haven’t been filtered as well as the more expensive ones. I rarely drink vodka because I rarely make drinks that require it (I prefer flavor in my spirits; gin is essentially vodka with natural flavored infused in it, so given a choice I’ll always select gin). Still, I have tasted my share of vodkas in the past. For drinking straight and chilled (as it’s traditionally consumed), I prefer the Russian brands (Stolichnaya is pretty good — at least what’s exported to the West). But I really can’t distinguish any flavor difference between that and Smirnoff (Stoli does seem a bit more smooth, but maybe I’m fooling myself). So when it comes to mixing drinks, I always buy Smirnoff. And I probably wouldn’t notice if I bought something even less expensive. I’m not suggesting that you fill your empty Grey Goose bottle with Smirnoff (or Popov). But it would be interesting to see how many people could actually tell the difference. Because vodka doesn’t have a flavor profile of its own, it’s the ideal spirit for cocktails in which non-alcoholic flavors dominate. In the case of the Bloody Mary, that flavor is tomato juice. In a Screwdriver, it’s orange juice. In a Cosmopolitan, it’s cranberry juice (among other things). Vodka just provides the kick — the other ingredients give these drinks their character. No one is quite sure where the Bloody Mary originated. As is the case with many classic cocktails, its origins are murky. In The Joy of Mixology, Gary Regan recounts the most widely accepted story, which says that the drink was invented by Fernand “Pete” Petiot at Harry’s Bar in Paris, sometime around 1924. Harry’s was one of the bars where Ernest Hemingway used to hang out (is there any bar where he didn’t?). So he probably sampled Petiot’s creation (is there any drink Hemingway didn’t sample?). Back then, the Bloody Mary was probably quite different from today’s drink. It most likely contained equal parts of tomato juice and vodka shaken together with ice, then served straight up in a cocktail glass. It may have included some lemon juice, but no Worcestershire, Tabasco, or anything else. Petiot was hired to run the King Cole Room at New York’s St. Regis Hotel in 1934. That’s probably when the Bloody Mary reached the US (although some people reject the whole Petiot story, and claim the drink was actually created at a New York speakeasy during Prohibition). The owner of the St. Regis, John Astor, objected to the drink’s name, so it was called the Red Snapper for a while. According to Regan, the original name returned sometime in the 1940s. And eventually, the Bloody Mary evolved to become the spicy concoction we enjoy today. The drink did not gain wide popularity in the US until the 1950s. That was the era when Americans were becoming acquainted with vodka, helped in part by a Smirnoff ad campaign featuring the entertainer George Jessel. Jessel also claimed to have invented the Bloody Mary (supposedly at 5 AM “when the bartender was asleep”). Once Americans discovered the Bloody Mary, they adopted it enthusiastically. And over time, variations of the drink proliferated: Substitute beef bouillon for tomato juice and you have a Bull Shot. Use Clamato and you have a Caesar (or a Bloody Caesar, Bloody Clam, or Clammy Mary). Pineapple Juice? That’s a Commander White. Replace the vodka with sherry? You get a Bloody Bishop. If you use bourbon, it’s a Bloody Derby. You can even use bacon vodka (this actually exists!) and have a Bloody Hogger. And, BTW, there is another drink today that’s called the Red Snapper — it uses gin instead of vodka. There are more, many more. But I think the classic formula is the best. So that’s what you’ll find me drinking — especially at a big Sunday brunch. Wow, that picture almost takes my breath away. Who can make tomato juice look so stunning other than you! Hi Chris, (blush) thanks so much for those kind words, and for commenting. I love tomato juice but have to say I've never acquired a taste for a Bloody Mary. Although I have to say your photo definitely looks appealing but that's nothing new. I still think you should write a book on beverages. With your photos and detailed descriptions even bartenders would be purchasing it. The good news is that I believe we can count this as one of our 5 servings of fruit and vegies each day! I'm down! This Bloody Mary looks very tempting and the presentation is so classy! Hi Vicki, I hadn't had one for years before I make them for this post. I'll definitely be having them again soon, because they have so much flavor. But it's definitely a breakfast or brunch drink, IMO, and you really want only one. Thanks for the kind words, and the comment. Hi Abbe, you're right about this being one of our servings of fruit & veggies every day! ;-) Great observation. Thanks for the comment. Hi Daniela, it's really tempting and delicious! Thanks for the kind words and comment, and Happy New Year! I really do appreciate these posts, John, and the work you put into them. Each individual cocktail's history fascinates me and wish I knew some this back when I was behind the bar. Thanks, nonetheless, and Happy New Year! I LOVE a good Bloody Mary - great post!!! I've forgotten how delicious this drink is. I'm definitely serving this the next time I have a family breakfast. They'll love it. I'm looking forward to seeing what you serve up in 2013! I might be more interested in a Bloody Mary if they were all made like this. Any I have had served have been little more than tomato juice and vodka, an extremely insipid cocktail. I generally prefer the more robust Canadian version, the Bloody Ceasar, but your recipe for the Bloody Mary sounds good. Hi John, this is a great drink, isn't it? Sounds like you prefer yours on the spicy side. You definitely need to make these at home when you have a nice brunch? It's fun writing these posts, so I'm glad you enjoy them. Thanks for that, and for taking time to comment. Hi Alyssa, glad I wrote about something you really enjoy! Thanks for the comment. Hi Judy, this really is a nice drink. The horseradish definitely adds a bit of extra kick. If you're in the mood for it, it's really quite nice. Thanks for the comment. Hi Natalie, I'll remember to make yours with extra Tabasco and to hold the horseradish. ;-) Thanks for the comment. Hi Carolyn, you make an excellent point about how you can dress up this drink. I've seen asparagus spears and all sorts of other cool garnishes. The assortment can be a lot of fun. Thanks for the comment. Hi Kristi, this is so great for a breakfast! And if you want, you can expand the recipe to fill a whole pitcher. Thanks for the comment. Hi Food Junkie, I haven't ordered this drink often when I'm out, but I've been lucky in the ones I've received - they've all been plenty spicy. But that's all the more reason to make them yourself! Thanks for the comment. I love a good Bloody Mary. You can send one right over for me. Thanks for sharing. Hi Dawn, I'd be happy to serve you one. Spicy or no? Horseradish? ;-) Thanks for the comment. I was thinking how appropriate for after New Years. "Hair of the dog", lol. Hope you and the Mrs. had a Happy New Years! Lovely cocktail and photos and lovely blog! I just tripped on to it from David's blog and I will be back. I am not a cocktail fan, but that first photograph is really great with the black background. Hi Gina, the theory of "hair of the dog" is mighty attractive, but the reality — or so I've been told ;-) — is disappointing. So we'll have to drink this drink for its own great merits! Thanks for the comment. Hi Carol, welcome! And thanks for commenting. Hi Haddock, glad you liked it! It was a fun photo to take. Thanks for the comment. I am not a big fan of Bloody Mary but you made this drink very attractive that is making me change my mind. You take really nice photos of drinks, thanks. Wishing you more success this year John. Happy New Year! I like tomato juice a lot but I don't like Vodka, however your pictures almost convince me to give it a try. I wish you a happy and healthy New Year John. My fav Sunday morning drink! I go with the splash of A1, I love the "meatiness" it provides. One of our traditions is to start every holiday with a Bloody Mary. Gotta love traditions! :) I usually don't add horseradish because the husband isn't a fan of it, but that shouldn't stop me from enjoying it. Need to add some next time. That sounds good! I've had bloody mary's with clam juice and am not a big fan of it. I like sticking to your standard recipe. Can't be something that good! So here's a big Happy New Year toast to you and Mrs. KR! Hi Ray, it's definitely a pretty drink with it's great red color and celery garnish. Thanks for the kind words and comment, and Happy New Year! Hi Frank, I'm not a vodka fan either, but it's fine in the Bloody Mary (you really don't taste it, although you're certainly aware you're drinking something alcoholic). Thanks for the comment, and Happy New Year! Hi Food Jaunts, this is great on Sunday morning! The A-1 is a nice variation. Thanks for the comment. Hi MJ, yup, traditions are good! One of the nice things about cocktails is you can mix 'em up to please different people, so you can make two, and each of you enjoy it the way you prefer. ;-) Thanks for the comment, and Happy New Year! I'm not that excited about bloody mary, I think I have a problem with a tomato juice :) but I like your picture. your drinks are always gorgeous and your presentation is flawless! my friend made me a virgin bloody mary once and i found the flavor a little too strong... or maybe it requires me to drink it a few times to get used to it...hehe. Hi Marta, is you don't like tomato juice this definitely isn't the cocktail for you! Glad you like the picture, and thanks for the comment. Hi Abeer, next time you might want to try less of the spicy flavorings, if the drink seems too strong. Thanks for the kind words, and the comment. Hi Lizzy, the Bloody Mary is always a good choice at brunch. If you don't want the booze that early in the day (I don't blame you), the virgin variety is delish. Thanks for the comment. This brings back such memories. My folks would serve these at parties. Thanks for the memories John. This is fabulous. I love, love, LOVE Bloody Mary's! If it's made right, nothing can compare. And yours looks like it's definitely made right! Hi Kim, this drink is still reasonably popular, but it used to be all the rage not all that long ago. Glad to refresh those memories for you! Thanks for the comment. Hi Kristy, you're so right that the drink has to be made "right" — to your taste — for it to be good. And I do like to think mine will appeal to most people. ;-) Thanks for the comment, and Happy New Year! Just the way I like mine. I just finished catching up with your posts and what do you know it will be cocktail time soon. Now which one of your many cocktails should I have this evening. Hi Karen, deciding which cocktail can be a tough thing! Lot's of fun, though. ;-) Thanks for the comment. I actually also like tomato juice with all the extras in this recipe but without the vodka. It's refreshing and feels almost like a food. Hi Suzanne, I agree with you that the virgin version of this drink is excellent -one doesn't miss the booze at all. And it is almost like food, isn't it? Very filling. Thanks for the comment. Hi Marina, sounds like your father has an excellent sense of taste! Distinguishing different wines by taste is something quite a few people can do (I can — blindfolded! — distinguish between red and white ;-) ), but it's remarkable that he can distinguish different vodkas and doesn't even drink vodka! Sorry to hear about your cold — hope you're well soon. Happy New Year! Hi Bam, it can sometimes be difficult to find a bar that makes this drink the way you like - it really needs to be spicy, IMO. But when well made, it's a tasty beverage! Thanks for the comment. Hi Terra, this is such a good drink! And spicy is definitely better. ;-) Thanks for your comment. I hear "Bloody Marys" often but actually I've never tried it before. What a beautiful drink! Hi Nami, it's a nice drink, and tasty. And for those that don't usually drink much, the virgin version is just as good as the real one! Thanks for the comment.